You are currently browsing the tag archive for the ‘London marathon’ tag. Happy Monday everyone! I’m feeling a bit groggy today, but at least my extended hangover from this past week has finally worn off. It’s time to get back to business, with final exams around the corner! Somehow everything converged on last week after my exam on Monday – every day had at least one or two things planned, whether it was just brunch/dinner, a high school get together, a department reception, a bachelorette party…yes, I am aware that this is called having a normal, healthy SOCIAL LIFE but after so many weeks of hibernation with my books it was very refreshing. And a bit intense…I really don’t drink much anymore, so one drink pretty much does the job for me these days! As a result, I didn’t have a very productive weekend in terms of school work, but I did manage to finally add a few races to the calendar. (Cut to me, tipsy, entering random races in the middle of the night – “Oh yes this will be FUN!”). Now that my coaching dates have been determined and my class schedule is set, I have a better sense of what races I am able to do. Before this weekend, I was only entered into the Brooklyn Half (in which I’m pacing E), the NYRR women’s mini 10k and the Chicago Marathon. So, my first goal was to plan two training half marathons to prep for Chicago – ideally I would race in mid/late July to see where I stand, but I couldn’t find anything I liked around then. So I plan to enter the Bronx Half Marathon on August 12th. I know it will be hot and I think the course is hilly, so I am not expecting a fast time, but I am expecting a hard effort. I usually like to race a second half marathon about 4-5 weeks before race day to finalize my marathon race pace. However, I’m struggling to find a local race on the weekend of September 8th – the only one I can find that looks good is the Chicago Half Marathon on September 9th, which obviously is not local at all. I’m dying to enter but it seems so indulgent (and not at all within my budget) to fly to Chicago twice. But how perfect a training tool would it be to race a half right near where I’ll be running the marathon?! So tempted…but still on the hunt for something a bit more reasonable. Any ideas, please send them my way! I also like to mix up my training by running one or two of my long runs in races – kind of like the Jog Shop Jog 20 miler I ran in the South Downs before the 2010 NYC marathon. It was a killer trail race and a great way to squeeze in my last long run and practice my race-day nutrition. I plan to do the NYRR long training run #1 (20M) on July 28th – I need a road race atmosphere to supplement my other long runs, most of which I’ll be doing by myself on Friday mornings. I also finally entered another trail race! E and I were trying to figure out where to go on vacation in August, and we were contemplating Colorado (I’ve always wanted to go there). When a friend recommended a perfectly timed 15M trail race in Steamboat Springs, that sealed the deal! We have both entered Steamboat and are in the process of getting some running friends together to join us. It will be like a TNF Endurance Challenge San Francisco reunion! The course looks TOUGH – the first 3M are straight uphill, not to mention the fact that we’re not used to running at altitude (hopefully arriving three days before will help…). 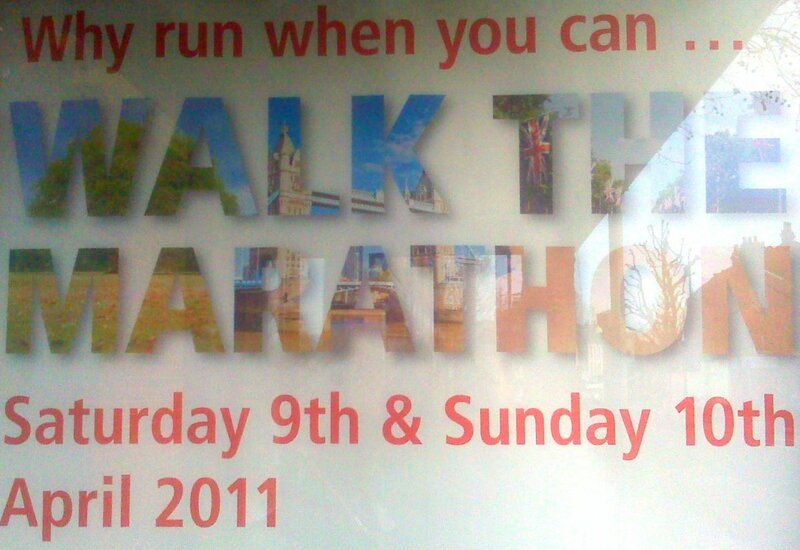 I’m supposed to run 20M that day and am using the race as a more exciting way to get the miles in (i.e. no time pressure), but I’m guessing I might be walking quite a bit on that course. Thankfully, as one of my Colorado friends said after a recent trail race, walking on a trail is known as hiking – so it will be a fun trail run/hike! Last but certainly not least, this morning in my post-weekend haze, I “accidentally” entered the ING NYC Marathon lottery. I had promised myself I wouldn’t and held out all this time the lottery was open – it’s a month after Chicago, it’s money I shouldn’t be spending if I’m lucky enough to get in and I’m more focused on coaching for that race this year, but with all those “last day to enter” tweets and facebook messages I couldn’t help myself. Suddenly my hands were typing and entering info and I was entered – oops! Of course, I also roped E in too. If I do get in, it will be a fun run. After the 2010 race, I really wanted to enter one year and run without any pressure, with a camera, interacting with everyone and just enjoying myself – so maybe 2012 will be that year! I woke up this morning with an urge to practice my “marathon pace,” which I’ve put in quotes because I’m not actually signed up for a marathon at the moment. As you may have guessed, I’ve caught marathon fever from yesterday’s London and today’s Boston marathons! I feel a renewed determination to get back out there and chase my next PB – 3:35, or perhaps even 3:30 on a flat course, if I put my mind (and body) to it. I managed to churn out a relatively fast 7.45 miles as I looped the river, averaging around 7:56 min/mile – although I think maybe Garmin got a bit excited during my first mile (it’s been taking forever to find reliable satellite signals recently), so perhaps more like 7:59 average. Either way, I was very pleased, especially given my long run on Saturday and my lack of sleep these past few weeks! It reminded me that even without regular hill sessions and interval training, my overall running fitness is still quite strong. Well, relatively strong. Every time I think about the average marathon pace of an elite woman runner, it is just mind boggling – impossible for me ever to attain, obviously, but still very inspiring. Speaking of which, if you weren’t following the Boston Marathon coverage earlier today, you missed a very exciting race. I was only following via my Twitter feed, so I can only imagine what it must have been like live or on the television – what a nail biter! I am a bit disappointed that Americans Desire Davila and Ryan Hall didn’t win (so close! ), but was truly impressed by the performances of these as well as many other runners today. Davila came in second with a time of 2:22:38, only TWO SECONDS behind winner Caroline Kilel of Kenya. 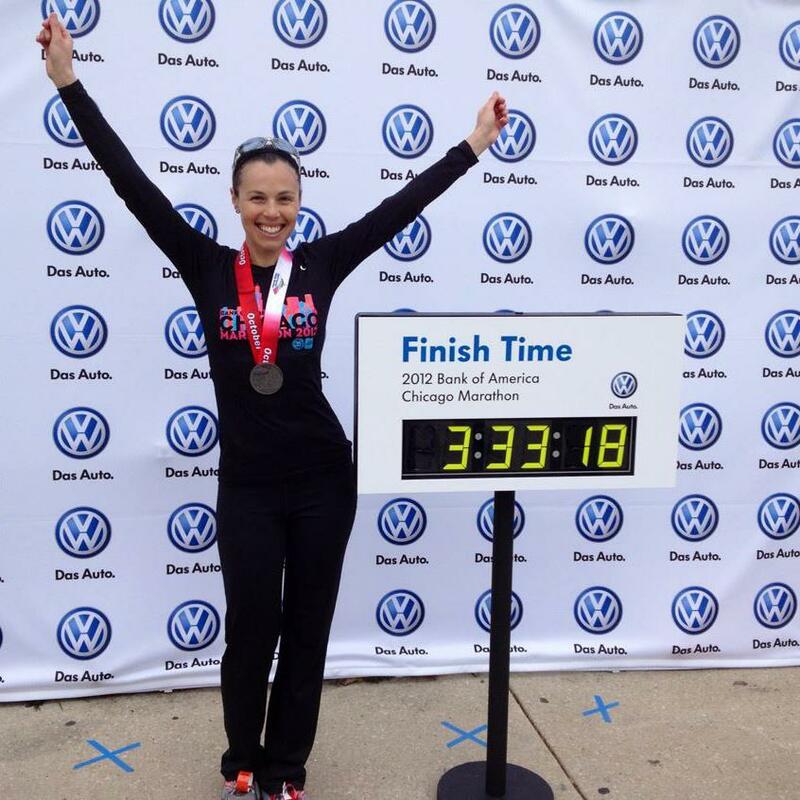 That placed her as the second fastest American woman marathoner in history! Ryan Hall unfortunately only ranked 4th place, but his time of 2:04:58 awarded him the title of fastest American runner ever. Yeah, I think I’d be pretty happy about that! Geoffrey Mutai, another Kenyan (of course – they’ve dominated many of the recent big marathons), won the men’s race in 2:03:02, the fastest marathon time ever recorded by nearly a minute! Unfortunately, however, it didn’t qualify as a world record because the Boston course has too much downhill from start to finish to be eligible. Yes, another reason I want to run this race! So it’s been a marathon-filled couple of days, and I’m now really craving a big race for myself. It’s great being a spectator, but nothing beats participating in – and finishing – a major event! In the meantime, Boston and London 2012 are calling my name. Which one will it be? Given that both require a lot of luck to be on my side (assuming I do not run for charity), I realize the answer might end up being neither, but I’m keeping my fingers crossed! Respect for all those who finished the London marathon today – I was roasting in the sun as a spectator, so I can only imagine how you all must have felt running 26.2 miles! I would have loved to have walked down the remaining miles of the course, as I did last year, to see some of the more exciting costumes and to soak up the finisher atmosphere, but I had to take off around 1pm unfortunately. I did get to see the masses through the 3:45-4 hour finishers at least! One of my favorite moments of the day, however, was on my walk home in the late afternoon. I was cutting through a small park in my neighborhood, and saw a man walking (well, limping) by himself with a finisher’s bag and medal in front of me. I congratulated him and asked him how his race went, explaining that I ran Paris in far less warm weather and really struggled towards the end so I really admired all the runners today. He collapsed on a bench and asked for some recovery advice (it was his first marathon), and said he was struggling to even make it home. After a few more minutes of chatting, he asked if I was walking in the direction of his flat (I was) and so I helped him along to his building. He was grateful to have someone to talk to and to keep him going all the way home – the second finish line! It was a brief encounter, but reminded me how much I love marathon day. The marathon is such an emotional and, particularly if you’re a runner, humbling experience. Everyone becomes so friendly and eager to connect with one another – it’s refreshing when you live in a big city. 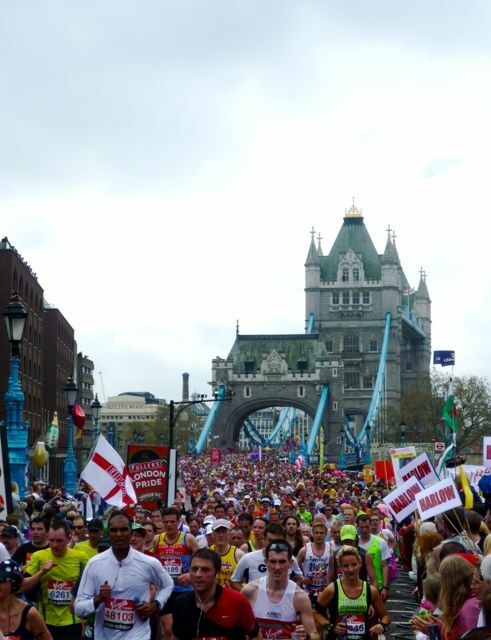 The London Marathon 2012 ballot opens on April 26th – I am 100% entering it! As many of you know, this is a big weekend for tens of thousands of runners across the world, who are gearing up to run the London and Boston marathons. I’ve been feeling a bit marathon nostalgic these past few days, as I’ve watched the barriers go up along the course and the runners descend upon the city. The best moment was of course when I was walking home from work on Friday and a pack of Kenyans flew past me on Tower Bridge – awesome! I really felt the marathon excitement building throughout this morning’s 14.5 mile run along the latter part of the course. Although I wasn’t feeling as fresh (or fast) as last weekend, it was a great run, save for the moment I nearly got trapped as I looped back towards the river! Marathon officials were already blocking off roads and, even though it was still relatively early, they had made tremendous progress in setting up all the high fences near St. James Park. Thankfully, I was able to sneak through just in time! Boston marathoners, I’ll be cheering you on in spirit on Monday – and if I’m lucky, running with you in 2012! Walk the London marathon?! Please. What if it’s for charity? Well, okay then. But walking the London marathon is still lame. The real question should be – why walk when you can…RUN the marathon? !